Was God unjust and unloving to order the total destruction of entire nations in the Old Testament? One of the most misunderstood attributes of God is His wrath against sin. In the Old Testament, we see graphic illustrations of how this wrath is unleashed on sinners without mercy. To many, God’s anger is offensive and cause enough to flee from His presence. We should give careful consideration to why the Lord is angry against sin. God did not purpose human beings for the suffering we have endured for the past six thousand years. It is because sin came into the world that the good and perfect creation of God has been perverted and corrupted. What should be a wonderful and abundant life for all of us has been ruined by the wrongful actions of people who are doing what is right in their own eyes, without regard to the welfare of others. Sin has prevented all human beings from experiencing the perfect life that God intended. It has caused unimaginable pain and heartache and plagued our planet since Adam. When the Lord could endure our misery no more, He allowed Jesus to come to earth and rescue us. In this amazing display of kindness, God allowed His own Son to take the wrath for our sins, so that we would be spared from all future wrath. Our vexation for sin should equal God’s displeasure. We should do everything possible to exile its scourge from the earth. All of the laws of human government are an attempt at holding sin in restraint, so that good people can live in peace and safety. Disease: A disorder of structure or function in a human being. A particular quality, habit, or disposition regarded as adversely affecting a person or group of people. Sin really is just a fatal disease that all human being have been infected with. God sent Jesus to be the cure for our sickness and to restore us to a perfect and healthy life. Was God justified in wiping out the entire Canaanite nation in the Old Testament? For almost 900 years, the Lord warned these brutal people to cease their worship of demonic gods and the offering of their children to the fiery hot arms of their sadistic god Molech. After nearly a millennia, these warnings bore consequences, as the Lord ordered the systematic destruction of all the nations of the Canaanites. Because of the patience of God, He was willing to delay judgement for an extraordinary long period of time. The Lord loved the Canaanites and earnestly desired that they would not see judgment but would, instead, turn to Him in repentance and be saved. Before the Lord ordered their complete annihilation, He would demonstrate for us a very important principle in the Old Testament: God’s hatred of sin is rooted in His love for us. Although God hates sin, His love for us is exceedingly greater. Although His law demands judgment for the sinner, His mercy offers us forgiveness. The consequences of sin is death, but the Grace of God offers us eternal life. Jesus was willing to bear all of God’s wrath for sin in His own body and die for all of our transgressions. Those who think God is willing to send sinners to hell should consider that His Son died so that this might never happen. God’s judgment is always preceded by a long interval of time. Before the Lord would order the destruction of the Amalekites, He would provide their nation with an extended period of time in which they might change their minds and come to Him for salvation. Before it is too late for each one of us, God allows an entire lifetime in order that we might decide to obey Him and receive His salvation. The Lord is always very patient, kind, and long-suffering towards us. Although each one of the Amalekites would face their own separate judgment at the conclusion of their life, the Lord would allow nearly 900 years before His judgment would fall on the entire nation. What we find in the example of the Amalekites is that God is not angry and spiteful, instead He is extraordinarily kind and patient. Although the Lord warned these nation to cease their evil, He relented from destroying them for a very long time. The Lord always gives us as much time as possible, with the hope that we will see how much He loves us and that His ways are far better than those we have chosen for ourselves. The obvious downside in a delay of judgement is that people develop the false idea that God really does not want to judge sin, or that He doesn’t care how they live their lives. I have often heard the spiritually naive make statements, such as: “My god loves me, and He will not judge me for my sin.” Although the Lord is very patient in dealing with human frailty, He will hold each of us accountable at the end of our life for everything that we have said and done. Matthew 12:36 (Jesus) But I say to you that for every idle word men may speak, they will give account of it in the day of judgment. The Amalekites each died and faced individual judgment for their sins. After nearly 900 years, the entire nation faced God’s judgment; and today, there is not a single Amalekite on the earth. Had the individual members of the Amalekites turned to God—no matter how evil their actions were—they would have been forgiven and granted a full pardon for all their sins. In the same way, each one of us has a decision to make. Either we agree with God that we are sinners, which is self-evident, and then accept His offer of forgiveness through Jesus’ sacrifice for us; or we will refuse. The wonderful promise of God is that—because Jesus has paid for our sins on the cross, all our sins have already been dealt with and judged. Every wrongful action and word that we have done throughout our life has been fully paid by Jesus’ death for us. Those who come to God in sincere repentance (willingness to stop sinning) and request that God would forgive all their sins according to Jesus’ death and resurrection—have the promise of God that they are forgiven and have as their present possession—eternal life. The Book of Exodus Chapter 34 describes how God will withhold judgment for an extended period of time, but He will eventually bring it upon a future generation. This is a staggering revelation. What we do, as a people, has profound consequences for future generations. We might think that our sins are a private matter; this assumption would be wrong. Just as the love and honor for God by America’s founders—allowed all of us to enjoy a great nation of peace and prosperity, so also will our present disobedience and dishonor of God—cause great peril and suffering upon future generations. Paul wrote in the Book of Romans that one of the purposes for God’s long delay in judgement is to display His grace and mercy. The Lord endured the terrible evil of the Amalekites for such a long time, so that in this delay, we might understand that God would much rather show us His mercy than His judgement. Those who think that God will not judge their sins today—because Jesus has not returned—have forgotten that in former times, God has waited for many, many years before finally bringing judgment and destruction on the unrepentant. How many of us would be willing to patiently wait for over 900 years for a murderer to repent, who had killed our son or daughter? Most of us cannot wait a few days for someone to apologize, who has hurt or offended us. Imagine the patience of the Lord in withholding judgment for 900 years against a brutal people who murdered their newborn babies as sacrifices to their god (sounds strangely familiar to the U.S. Today). In the Old Testament, we see two important elements of God’s nature that is reflected in His Love—as well as His absolute desire for justice. Although God loves human being so much that He was willing to give His only Son to die for us, He will not allow those who continue in their wrongful actions to remain without judgment forever. The New Testament is a wonderful commentary on this patience of God that has been displayed for all of us to see. We observe both the love of God and the justice of God being demonstrated by His allowance of Jesus to die for the sins of the world. 1 John 4:9-10 In this the love of God was demonstrated for us, that God has sent His only begotten Son into the world, that we might live through Him. 10 This is love, not that we loved God first, but that He first loved us and sent His Son to be the payment for our sins. God loves people so much that He allowed His only Son to come to earth and die for us. God hates sin so much that He poured out His wrath on His Son, who bore all our sins. God will grant each one of us a full pardon for every wrong thought, word, and deed which we have committed, throughout our life—if we will only come to Him in sincere repentance and turn to Jesus as the payment for our sins. Although He waits patiently for us to repent, He has promised a day certain when His patience will run out; and He will judge all sin. We long for the Love of God; but we recoil in offense at His justice when He carries out the sentences that He warned us would come—if there was no repentance for sins committed. When Abraham was born in Haran, the Canaanites were already heavily occupying the entire area of land that would one day be the future home of Israel. Interesting fact: Abraham, the father of the Jews, was born in 1948 by the Hebrew calendar. The nation of Israel became a nation once again in 1948 A.D. The Canaanites are the descendants of Canaan, the son of Ham, one of Noah’s three sons. Among the Canaanites are the most infamous—the Amorites, who lived in the hill country of Israel. 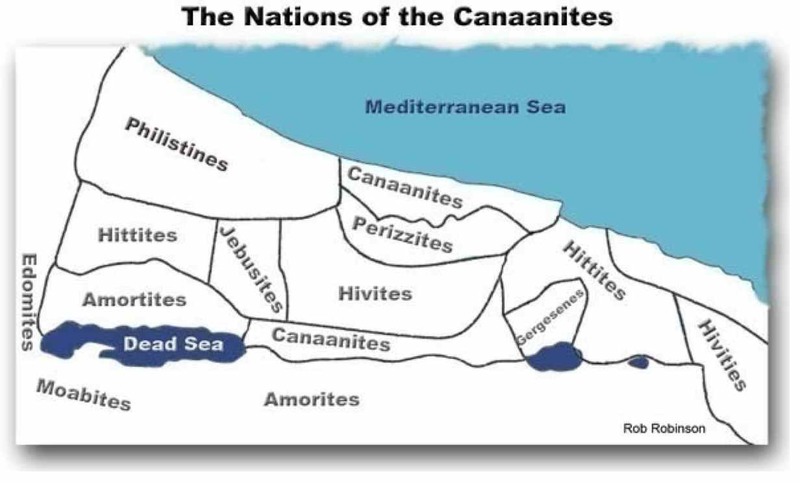 The rest of the Canaanites include: the Perizzites, Hivites, Jebusites, Hittites, Moabites, Edomites, Philistines, and Girgashites. The people of the Canaanite nations were some of the most brutal and vicious human beings who have ever lived on the planet. While Israel was traveling across the desert on their way to the land that God had promised, the Amalekites ruthlessly tormented, attacked, and killed God’s people. As a result of their cruelty to Israel, the Lord instructs Moses to record these events, so that later generations might understand when God finally sends judgment upon the Amalekites—so that His actions would be justified. In the Book of Deuteronomy, as the Lord is instructing Moses in the statutes and requirements for the people, He also tells Moses: Remember what Amalek did to you. This is a reminder for the future when the people come into the land that God has promised them, so that they will understand why He will instruct them to completely annihilate the Amalekites from the face of the earth. Deuteronomy 25:17-19 Remember what Amalek did to you on the way as you were coming out of Egypt, 18 how he met you on the way and attacked your rear ranks, all the stragglers at your rear, when you were tired and weary; and he did not fear God. 19 Therefore it shall be, when the LORD your God has given you rest from your enemies all around, in the land which the LORD your God is giving you to possess as an inheritance, that you will blot out the remembrance of Amalek from under heaven. You shall not forget. 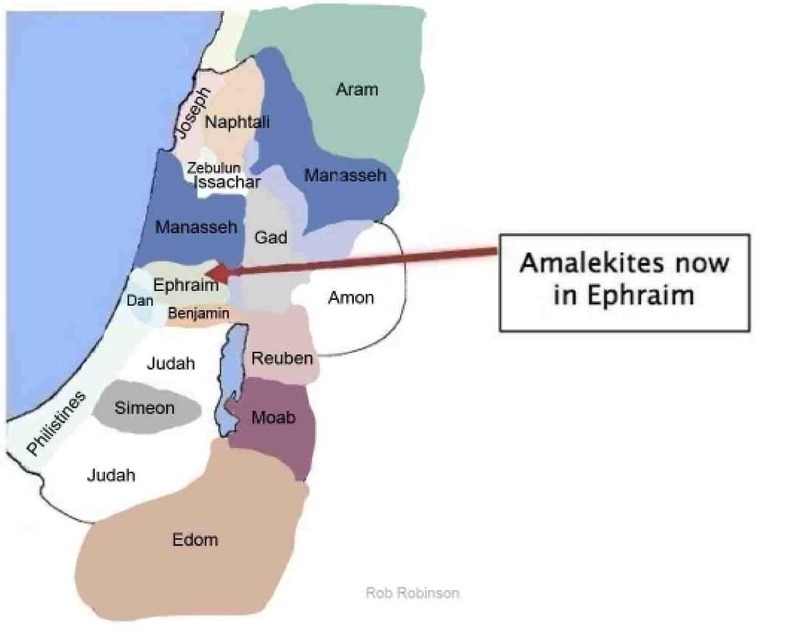 There are two places in the Old Testament where the Lord describes Israel as being attacked from the rear by the Amalekites: At Rephidim and Hormah. Exodus 17:8 Now Amalek came and fought with Israel in Rephidim. Number2 14:45 Then the Amalekites and the Canaanites who dwelt in that mountain came down and attacked them, and drove them back as far as Hormah. In a large group of more than 2 million people—making their way across the desert of Sinai, there would be many thousands of elderly, the sick, and women with children, who would be at the rear of the multitude of Israel. The Amalekites viciously came up from behind and slaughtered the weak and the helpless who were already traveling by great difficulty. At the beginning of the Book of Deuteronomy, Moses begins his instructions to the people whom he has led out of Egypt by God’s power and grace. In chapter 9, Moses reminds the people that God has not led them into this new land because they were righteous and deserved the land; it was because of the wickedness of the Canaanites that God was going to drive these nations out. God remembers the cruelty of the Amalekites, but He will not destroy them just yet. He is still granting time for repentance. This is a fact that those who condemn God for finally destroying the Amalekites—forget. Many people incorrectly assume that God suddenly gave an order to indiscriminately destroy women and children without mercy. What we discover is that the Lord allowed the Amalekites nearly 900 years before His judgment arrived. 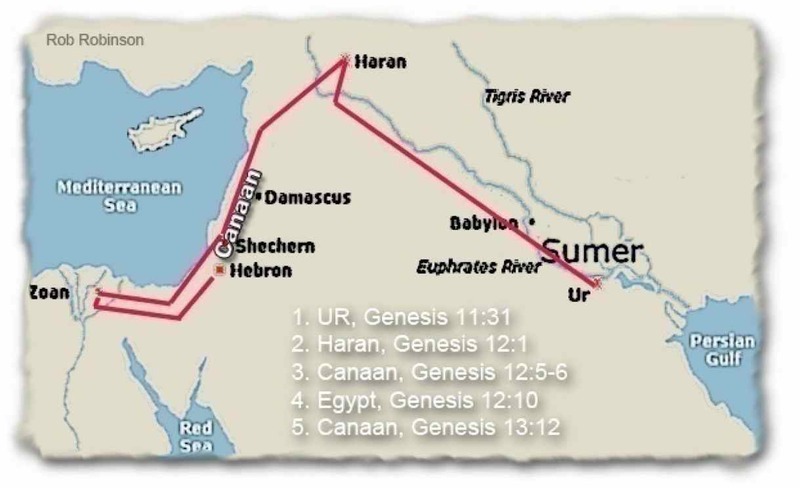 When God had called Abraham to depart Haran and go into the land of Canaan, He told him that the land that the Canaanites occupied would be given to him and his descendants forever. 1. When the Lord first came to Abraham, he was living in Ur. 2. The Lord instructs Abraham to depart Haran for Canaan. 3. Abraham arrives in Shechem, where the Canaanites dwell. Genesis 12:5-6 Then Abram took Sarai his wife and Lot his brother’s son, and all their possessions that they had gathered, and the people whom they had acquired in Haran, and they departed to go to the land of Canaan. So they came to the land of Canaan. 6 Abram passed through the land to the place of Shechem, as far as the terebinth tree of Moreh. And the Canaanites were then in the land. 4. Abraham departs Canaan for Egypt because of a famine. Genesis 12:10 Now there was a famine in the land, and Abram went down to Egypt to dwell there, for the famine was severe in the land. 5. Abraham return to Canaan, where he lives with Lot. Genesis 13:12 Abram dwelt in the land of Canaan, and Lot dwelt in the cities of the plain and pitched his tent even as far as Sodom. When Abraham received the promise of God that He would make him a great nation—from where the future Messiah would come—He also informs Abraham that the iniquity of the Amorites is not yet complete. This prophecy of the total annihilation of the Amalekites was fulfilled precisely as God had said. There are no Amalekites anywhere on the earth today. Nine hundred years after the Lord first made this declaration, He kept His word and destroyed the nation of Amalek through Saul. 1 Samuel 15:3 (the Lord speaking to Saul) Now go and attack Amalek, and utterly destroy all that they have, and do not spare them. But kill both man and woman, infant and nursing child, ox and sheep, camel and donkey. This verse is regarded as one of the most difficult portions of scripture to understand that is in the Bible. The Lord orders the complete slaughter of all men, women, and children—including all infants and nursing children—as well as every animal. The Critics of God use this verse as an example of the viciousness of God. They assert that God is not nearly as loving as He claims. They maintain that God is angry, vindictive, and cruel. They claim that God is dual in His personality: loving and merciful in the New Testament, while vengeful and bloodthirsty in the Old Testament. The reason that people have developed these ideas is because they don’t know God nor comprehend His word. It is common for people to make untrue statements about people whom they do not know, nor have any type of relationship with. This is what human beings do: They judge without knowledge of the true facts. We read and observe what the Bible says that God has done; and, many times, we don’t have a clue what is really going on. The fact that the Old Testament discloses these verses of scripture to us, describing God’s command to destroy these nations entirely, should reveal a few clues for us. The recording of these events serve to validate the fact that the Bible is a true and accurate account of actual occurrences, not contrived stories or myths. If someone were seeking to convince a skeptic that they should surrender their life to God and believe in Him, they would not disclose information about Him that reveals a side of His personality that might be misunderstood. The fact that the Bible is completely honest with us in regards to the true nature of God—speaks volumes of its authenticity. The fact is—the Bible is a true account of God. The Amalekites and the entire Canaanite culture were amongst some of the most evil people who have ever lived on the face of the earth. The Word Amalekite means “A People that licks up”. This gives us a clue as to the kind of people we are speaking of. The Amalekites were a populace who literally licks up or drains away the life of other people. The Amalekites had no permanent home; they were nomadic, roaming from place to place in the Sinai desert. They were descended directly from Ham, whose son Canaan was cursed by God because of his sexually perverse character. The Amalekites were the specific tool used by satan, to try and destroy God’s people—before they ever departed Egypt and arrived into the land God had promised. Deuteronomy 25 contains a direct statement from the Lord, that the Amalekites did not fear God. Deuteronomy 25:17-19 Remember what Amalek did to you on the way as you were coming out of Egypt, …and he did not fear God. The Amalekites attacked the helpless, the sick, and the old, when Israel first came out of Egypt. They attacked Israel a second time, at Hormah, without being provoked, as described in Exodus 17. They joined a third time with Eglon and attacked Israel in the days of the Judges. Whenever Israel planted their crops, the Amalekites along with the Midianites in Judges 6, destroyed Israel’s animals and crops. These debased people practiced child sacrifice, which is confirmed by archeological artifacts discovered in the remains of Amalekite villages. In 2 Kings 23:10 and Jeremiah 7:31, there is a vivd description of how the Amalekite children were offered to one of their most blood thirsty gods, Molech. 2 Kings 23:10 And King Josiah defiled Topheth, which is in the Valley of the Son of Hinnom, that no man might make his son or his daughter pass through the fire to Molech. 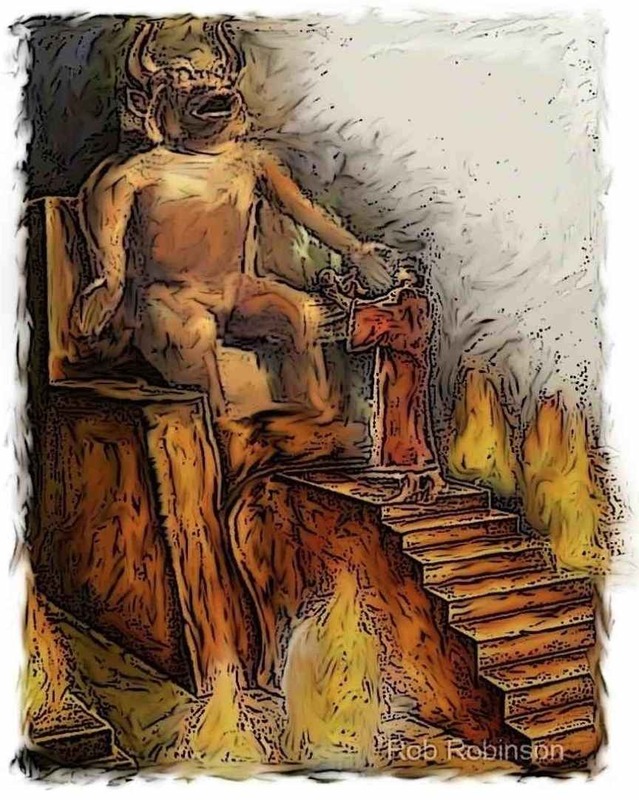 Molech was a great cast iron god that sat upon a stone throne above the people. His body was hollow, with an area at the lower section of the statue where a fire could be kindled. The flames of the fire would superheat the cast iron—at times—develop such high temperature, that fire was said to shoot out from the outstretched arms of Molech. A newborn baby from a willing family was placed live on the outstretched arms of this vicious god, where the infant would be burned to death. This was one of many horrible gods that the Canaanites worshipped. Archeologists have uncovered the ruins of Canaanite villages and found the remains of clay jars that were used in their ritual worship. Newborn babies were dismembered, and their body parts were placed inside these jars and sealed inside the walls of newly built homes—to bring the blessings of their brutal gods. It is not necessary to list all the horrendous acts that were perpetrated by the Canaanites. It is sufficient to say—if all the facts were known by people today, the horrific deeds carried out by these cruel people, we would likely commend God for ending their lives. The Amalekites were among the four kings that Abraham defeated, who had taken Sodom and Gomorrah captive as well as Abraham’s nephew Lot. In the period of the Judges, the Amalekites joined forces with the Ammonites and King Eglon of Moab to attack and capture Jericho. The Amalekites were defeated by Gideon and his armies at the valley of Jezreel, where the future Battle of Armageddon will be fought. By the time Saul is king of Israel, the Amalekites had gained a mountain in the land of Ephraim in Israel, where they were once again living and multiplying. The Amalekites had heard of God’s pronouncement of their destruction for more than 900 years, and yet they did not repent of their sins and turn to God. This is in contrast to Nineveh, where Jonah was sent by God to speak the same message of future judgment that would result if they did not turn away from their wickedness. At the preaching of Jonah, Nineveh did repent and turned to the Lord. True to His promise of mercy, the Lord relented from bringing His judgement, sparing Nineveh total annihilation. Jonah 3:1-10 Now the word of the LORD came to Jonah the second time, saying, 2 “Arise, go to Nineveh, that great city, and preach to it the message that I tell you.” 3 So Jonah arose and went to Nineveh, according to the word of the LORD. Now Nineveh was an exceedingly great city, a three-day journey in extent.4 And Jonah began to enter the city on the first day’s walk. Then he cried out and said, “Yet forty days, and Nineveh shall be overthrown!” 5 So the people of Nineveh believed God, proclaimed a fast, and put on sackcloth, from the greatest to the least of them. 6 Then word came to the king of Nineveh; and he arose from his throne and laid aside his robe, covered himself with sackcloth and sat in ashes. 7 And he caused it to be proclaimed and published throughout Nineveh by the decree of the king and his nobles, saying, Let neither man nor beast, herd nor flock, taste anything; do not let them eat, or drink water. 8 But let man and beast be covered with sackcloth, and cry mightily to God; yes, let every one turn from his evil way and from the violence that is in his hands. 9 Who can tell if God will turn and relent, and turn away from His fierce anger, so that we may not perish? 10 Then God saw their works, that they turned from their evil way; and God relented from the disaster that He had said He would bring upon them, and He did not do it. The prophet Jeremiah said that if any nation would turn from their sins to the Lord, He would not destroy them. Jeremiah 18:7-8 The instant I speak concerning a nation and concerning a kingdom, to pluck up, to pull down, and to destroy it, 8 if that nation against whom I have spoken turns from its evil, I will relent of the disaster that I thought to bring upon it. The Lord made the same promise of destruction to His own people, if they would not listen to His word and turn from their sin. When Jonah brought God’s warning to Nineveh, they listened and turned from their sin; and God ceased in His promised destruction of their nation. We should understand that our Great God of Love is also a Great God of Justice. The Lord could not possibly be righteous if He did not punish sin. It is morally wrong to allow the guilty to go unpunished. At the Cross, the Lord showed us the magnificent example of Love and Justice working together. We were guilty; God judged our sins by punishing His own Son. In doing this, His justice was satisfied; and He was able to maintain His righteousness while, at the same time, showing His Great Love. The total destruction of the entire Amalekite nation was a righteous and justifiable action by God against an evil that had to be dealt with. Those who condemn God for His judgement of the Amalekites or see a different God in the Old Testament from the God of the New Testament have not correctly understood Him. God displayed an amazing duration of patience with an evil and debased group of people, who rightfully deserved a much swifter judgement than they received. God waited because He is loving and kind and does not take any pleasure in destroying even wicked people. It has always been the sincere desire of the Lord that all people would repent and come to Him for salvation. He cannot, however, save anyone without their full consent. Although God is unlimited in His power and might, He will not use His great power to force anyone to come to Him so that He can show His love and mercy. This decision rests with each one of us. He has warned us what the consequences of our actions or inactions will be, so that we will have no one else to blame but ourselves—if we do not heed His warning. Those who state that there are two different Gods between the Old and New Testament, have failed to understand the points of this chapter. Yes, God hates sin and has promised to punish all sinners. Just as important is the fact that God has already punished all sin, in His Son. Jesus bore the full wrath of God for all sins and has made forgiveness and eternal life as simple as requesting it from God. We have embraced the grace of God—while forgetting His just and righteous hatred of sin. One of the reasons that people mistake this second attribute of God—His justice and punishment of sin—is that we don’t understand the Holiness or perfection of God. We fail to understand the full effects that sin has on human life. God, who sees every event at once, understands that billions of lives have been devastated—all because of Adam’s disobedience and our continuing decision to sin ourselves. We forget that we are only here on the earth for an extraordinarily short period of time. God, on the other hand, lives forever. Who are we to protest the actions of an eternal being with the power to create the vast universe that we have come to observe? Can we instruct God? Can we judge His wrath against sin as a wrongful action? Do we have the capacity to understand the reasons why a transcendent being of unlimited power and wisdom has determined the specific details for how all of us can be saved? All we can do is fall at His feet and humbly ask for His mercy, for He has described a day in which all of us will give to Him a full account of our life. We will not be able to utter a word nor execute a single excuse for why we did not submit our lives fully to Him. The words of the 90th Psalm perfectly illustrate the contrast between us, as temporal and imperfect beings, and God who is perfect in every way, as He lives forever. We are transient, frail, and passing away every day that we live. Yet, in our weakness, God loves us all. He will, however, only put up with our sin and rebellion for so long. The fact that we can observe the judgement of God so carefully depicted for us, in various places throughout the Old Testament, should greatly humble us and bring our hearts to repentance. As surely as God has judged the horrible acts of the Canaanites, He will also bring into judgement all of our sins, if we do not repent and turn to Him for Salvation. There are appropriate reasons for why God does everything. If it seems that God is unfair in any regard, then we have not fully understood the purposes and plans of God. An important principle that should be understood of God is that He is perfect in every way, and it is impossible that He could ever do any wrong. In order for God to be God, He must be perfect. Therefore, if He had the capacity to ever do any wrongful action, this would show that He is not perfect and not God. Everything that He does is always Good, Right, and Just. We must understand and accept this basic principle before we can progress any further with God. Hebrews 11:6 But without faith it is impossible to please Him, for he who comes to God must believe that He is God, and that He is a rewarder of those who diligently seek Him. The origin of the word “Good” came from the ancient English word “God.” Those who created the word “good” used the example of God’s goodness as their model. All Good is defined by the perfect goodness of God. Any person who claims that God is not Good in every way is wrong. Their understanding of what God has done has been incorrectly interpreted. We must start with a foundation that enables us to sincerely believe that God is Good, or we will never be able to correctly understand Him in anything that He says or does. David wrote that when the Messiah arrives, those who come to Him for their Salvation must do so with fear (deep respect), rejoicing (worship), and trembling (awareness of His Holiness). The Book of Leviticus establishes the manner and attitude in which we must come to God. To regard the Lord as Holy means to understand that He is perfect in every way. He is completely Good, and it is impossible that He could ever do wrong. All that God asks of us is all that He asks of Himself. Although critics of the Bible constantly highlight moments in the history of man when God brought judgement, there are far more examples of His grace and mercy and constant provision and care for all people. In reality, God is always far more patient with us than we would ever be with anyone ourselves. Our sense of justice in punishing evil provokes us to vengeance; while God waits for the guilty, giving as much time as possible for the hard and obstinate hearts of people to change. Numbers 14:18 The LORD is longsuffering and abundant in mercy, forgiving iniquity and transgression; but He by no means clears the guilty. Many have criticized God for His order of the total destruction of the Canaanites. What these critics have not realized is that from the time that God told Moses that He would destroy these people, until the eventual destruction of all their nations, there was a period of about 900 years. In Genesis 15, God informs Abraham that He will destroy the Amorites, but not until their “iniquity is complete.” He will give them adequate time to repent. This verse was given to Abraham at about 1926 B.C. God orders the total destruction of the Amalekites, in 1 Samuel Chapter 15, by King Saul. This order came about 1028 B.C. God told us in advance of His actions, what He was planning—by the prophetic word. The intent and purpose of this book is to demonstrate the transcendent and extraterrestrial origin of the Bible. We understand who God is, by what He has written and how He fulfilled every promise of His word. Expositional Commentary on the Amalekites of the Old Testament.